Need More Customers? Travel is still the #1 incentive that encourages people to take action. 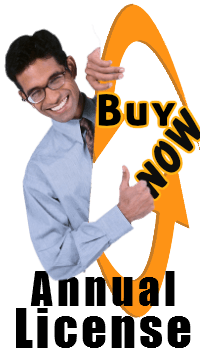 Give away unlimited free 3 days, 2 nights hotel stay certificates to boost sales. Over 50 popular vacation destinations to choose from. ***We guarantee that 100% of your certificates will be honored. Cash Savers has a spotless record of over 25 years in business and an A+ rating with The Better Business Bureau. Never a time share presentation to attend. Order by November 30th, 2018 and receive exclusive discounts and special offers with savings up to 40% for theme parks, attractions, Broadway shows, special events, hotels, concerts, and movie tickets. Its all in one place delivering fun for everyone. This offer includes Disneyland, Disney World and Knotts Berry Farm and is not available to the general public. You give this to all of your friends, relatives and customers! You get a one year’s license to give away unlimited free electronic hotel stay certificates to boost sales and stay ahead of the competition. Use them to generate traffic, book appointments to hear a sales presentation, recruit members or build a down line. Order by August 25th, 2018 and receive exclusive discounts and special offers for theme parks, attractions, Broadway shows, special events, hotels, concerts, and movie tickets all in one place delivering fun for everyone. This includes, Disneyland, Disney World and Knotts Berry Farm. This offer is not available to the general public. You can give this to all of your friends, relatives and customers! This license to give away free hotel stay certificates renews automatically on your anniversary date unless you cancel 7 days prior to that date. You can cancel your subscription through your PayPal account. Use free hotel stay certificates an incentive to visit your web site or show room. Use as a bonus to encourage people to buy. Use for birthday gifts, contest and rewards. Use for corporate gifts and bonuses. 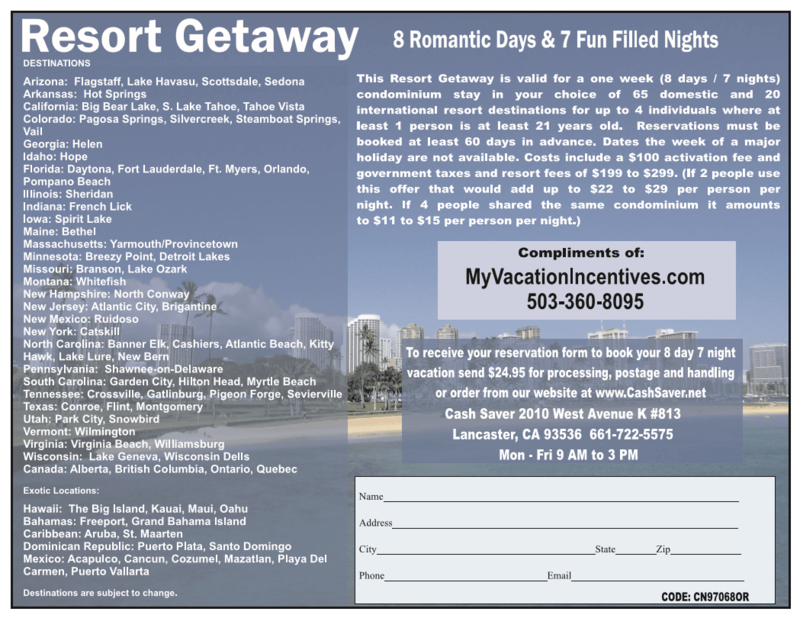 License to give away unlimited free hotel stays is $99.00 a year. As a renewal bonus, you will receive our private manual on how to travel anywhere in the world for free. A $249.00 value. Not only will you be able to travel anywhere for free, you will also make a nice income at the same time. New customers can purchase this for $29.00 by calling Anderson Marketing Concepts and leave a message. “When I send people to my landing page, I give them a free 3 DAY, 2 night hotel stay. They couldn’t believe that they only had to pay the hotel tax and didn’t have to sit through a sales presentation. Carol charges me $.80 a piece for the free hotel stay certificates plus S & H. . They are in color. What a bargain. I couldn’t print them that cheaply myself. I order 100 at a time. I give them away to prospective customers, family, friends and business associates. I think the $99.00 price is a bargain. Most vacation incentive companies charge $99.00 a month. Besides being able to give away free hotel stays, I can now book all of my travel myself and have saved a ton of money. I just log in, put in my special code and save big time just like travel agents. “I love this program. With the bonus that Carol just gave me, I can travel anywhere in the world and save up to 70%. It’s like being my own private travel agent for free. “I was skeptical at first so Carol suggested that I use the free hotel certificate myself, which I did. My best friend and I were planning a trip to Los Angeles so we stopped in Vegas for 2 nights. Yes, there was no time share presentation to attend and not only did we only have to pay room tax, which everyone has to do, we also got some discount coupons for dinner and a show. We’re now planning a trip to Mexico. As a VIP card holder, I get to enjoy and all inclusive 4 day, 3 night stay at a luxury resort. It includes, all meals, snacks, golf and everything that the resort offers. All for $120.00 a day for 2 people. Since club members get to take advantage of the 8 day, 7 night luxury resort stays for under $399.00 for the week, we’re heading out again. There are over 60 choices at exotic locations. Thanks to Carol, I never pay full price for anything. “I’ve used the hotel certificates 3 times now and my only complaint is that you have to plan ahead 60 days in advance. I’ve enjoy it every time. I like it that they have 40 different destinations to choose from. If you want to save money on travel, this is the way to go. If you want to be popular, this is also the way to go. I like dealing with a company who’s been doing this for over 25 years. With the new bonus having my own personal travel portal, I don’t have to book 60 days in advance. I can do the booking myself without any advanced notice and still save money. I saved 60% on a room in Vegas with a 2 day notice. It wasn’t the free hotel stay, but I did save big time. “I’ve been giving my prospective customers free hotel stays for over 5 years. The great thing is that I can give them a free 3 day, 2 night stay every year and I get a lot of referrals from this. I have even given special hard to close customers 4 nights in Hawaii. They can’t believe that all they have to pay is the hotel tax and a small processing fee. Most assume that they have to attend a time share presentation. When I tell them there is none, they asked me for a couple of extra certificates to give to relatives for their birthday. Of course, I’m happy to do so. It’s great for referral business. I sell luxury cars for a living. I recently gave a customer the $399.00 7 night luxury condo stay. I paid the $399.00 myself rather than discount the car. He never did ask for a discount. Great closing tool for me. I feel like an idiot. Wish I had meant Carol years ago when I spent $16,000 on a time share. I pay over $350.00 a year just for maintenance fees and between $300-$500 when I book my vacation. It cost too much to use and no one wants to buy it. I took advantage on the 7 night luxury condo stay. It was better than my 7 night timeshare stay it only cost me $399.00 total. Next trip, Bahamas for the 3 night all inclusive resort stay. My advice to everyone, do not buy a time share. You are flushing your money down the toilet. I enjoyed the free 3 day, 2 night stay in Vegas. My only complaint is that I had to book it 60 days in advance. I only had to pay the hotel taxes. I can now use my own travel portal and book my room any time without waiting. I don’t have to wait the 60 days because the hotel savings really are huge with the new program Carol has added. I pay what travel agents pay. With the Gold membership, I recouped my money almost immediately and will save big time throughout the year. I am enjoying my personal booking portal. I travel a lot. What a wonderful tool and huge savings. Ive given the free hotel stays to all my friends and relatives. Are you ready? Get your 1 year membership here or contact us for further information. We have covered the most common questions. If you need additional information please use our contact page or call us toll free at 844-343-7802. How many certificates can I give away monthly? As many as you want. You have an unlimited supply of electronic certificates. Besides room tax, is there any other fee involved in using the free hotel stays. Yes. There is a onetime $12.00 processing fee that goes to the travel company that books your reservation. With hotel tax and the processing fee, your nightly stay should be around $22.00 a night. Your license to give away unlimited free hotel stay certificates is good for one full year. License renews automatically unless cancelled 7 days prior to renewal date. How often can a person use a certificate? Only 1 certificate may be used per family, per city in any 12 month period. Are all of the certificates electronic? No. We also have 8 ½ by 3 ½ full color, 2 sided hard copies available. How much do hard copy certificates cost if I want to give some away to customers.? Cost for each printed certificate in color on both sides is 80 cents plus $7.00 S & H. Minimum order is 100 certificates. You can mix and match. Can I sell individual certificates? No. Only licensed travel personnel can sell vacations. You can sell the certificates to businesses to give away as incentives and rewards. You can give them away for promotions and incentives. They can also be used for fundraising. We can provide you with our free fundraising kit. You can sell them to businesses for $1.00 to $5.00 each or for whatever the market will bear. Does my license allow me to sell individual vacations to the end user? No. That is against the law. Only licensed travel agents can sell vacations. You can sell certificates to businesses to give away to their customers. You cannot sell the actual vacations. Yes. You can receive $45.00 for each person you refer that purchases a license. How do I redeem a certificate? 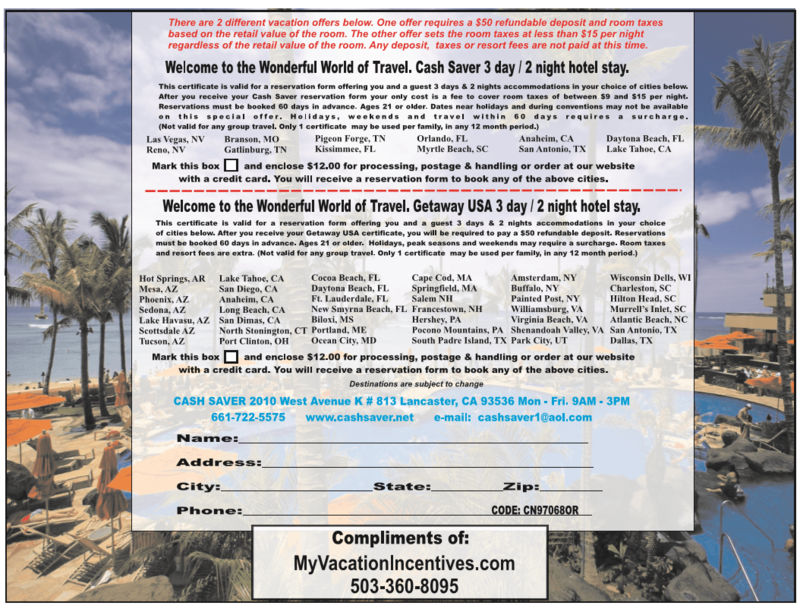 Once you receive your free hotel stay certificate, you will book your reservation at: www.cashsaver.net. This is a very short form and is where you pay your $12.00 processing fee. In the additional Information box, it will ask for a coupon code or the company or person that issued the certificate. It will say “Compliments of” on the certificate. Certificates will not be honored if this information is missing. How many people can use a free room certificate at one time? Certificate is good for 2 adults. You can make arrangements with hotel staff if there is going to be more than 2 people. For the 8 night, 7 day luxury condo stay for $399.00, it can accommodate 2- 3 families. Am I required to attend a time share presentation? Why are the hotels giving away free rooms? Most hotels have unsold rooms and want your future business. Their slow time is Monday through Thursday so they want to fill up their rooms during those slow times as they still have to pay employees. Reservations must be booked 60 days in advance. There are over 50 popular vacation destinations available. You will be responsible for room tax and a $12.00 processing fee. Transportation and food is not included..
Are Their any other rules? No. Customers are guaranteed to receive their requested travel dates when booking reservations 60 days in advanced without selecting holidays and weekends.. For a small upgrade fee, weekends and holidays are available as well. Will I really receive the free room? Yes. We guaranteed to honor every certificate. We have 120,000 rooms available per day. We invite you to check us out with Federal, State and local agencies. Cash Saver has a spotless record of over 23 years in business and an A+ rating with the Better Business Bureau. Yes. There is a onetime $12.00 processing fee that goes to the travel company who issues the certificates. That’s how the travel company makes their money. You will see that when you book your room at www.cashsaver.net. With the room tax and processing fee, your out of pocket cost should be less than $20.00 a night. Once you receive your free hotel certificate, you will book your reservation at: www.cashsaver.net. This is a very short form and is where you pay the $12.00 processing fee. In the “Addition Information box,” it will ask for a coupon code or the company that issued the certificate. It will say “Compliments Of” on the certificate. Certificates will not be honored if this information is missing. What are the most popular destinations? 95% of the people want to go to Vegas. Since the casinos have a special relationship with a number of airlines, air fare to Vegas is cheaper that other destinations. What hotels are available in Las Vegas? The inventory changes. We deal with a dozen hotels to make sure you are 100% taken care of. Do the hotels give out perks? Yes, especially in Vegas. They want your return visits and will do anything they can to make you want to come back. Like discount food and live shows. How long will it take to get my virtual free hotel stay certificate? Usually the same day during our regular office hours Tuesday through Friday. 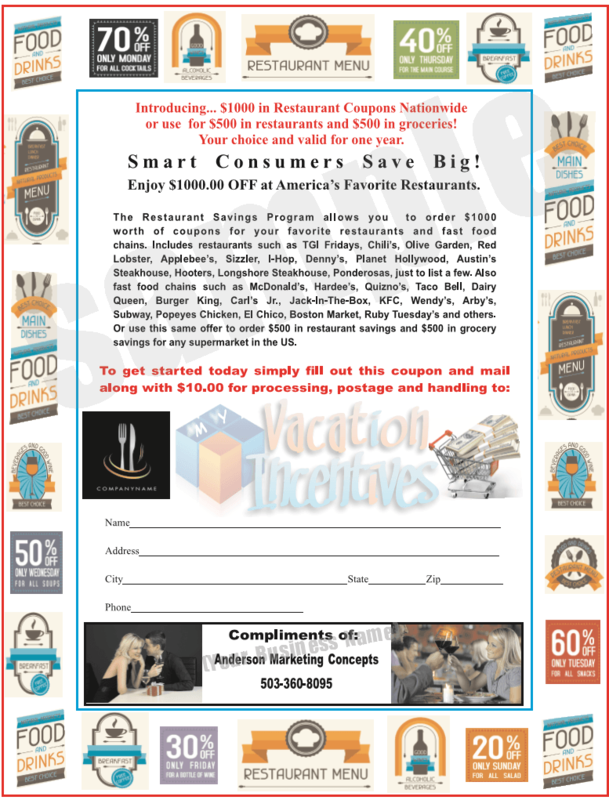 What restaurants are available for the Restaurant Certificates? The list does change but you can keep up with those changes once you activate your membership. This partial list of your favorite restaurants and fast food chains nationwide includes restaurants such as TGI Fridays, Chili’s, Olive Garden, Red Lobster, Applebee’s, Sizzler, I-Hop, Denny’s, Planet Hollywood, Austin’s Steakhouse, Hooters, Longshore Steakhouse, Ponderosas, just to list a few. Also fast food chains such as McDonald’s, Hardee’s, Quizno’s, Taco Bell, Dairy Queen, Burger King, Carl’s Jr., Jack-In-The-Box, KFC, Wendy’s, Arby’s, Subway, Popeye’s Chicken, El Chico, Boston Market, Ruby Tuesday’s and many more. We cannot guarantee participation in every one of these restaurants as the list does change from time to time depending on each restaurant’s advertising policy. Is the $1000 Supermarket Magic valid at any supermarket. Yes at any market that accepts coupons. You purchase certificates for as little as 10 cents that are GUARANTEED to save you $1000 on the groceries of their choice a year. Coupons do have expiration dates so you need to keep up with that. 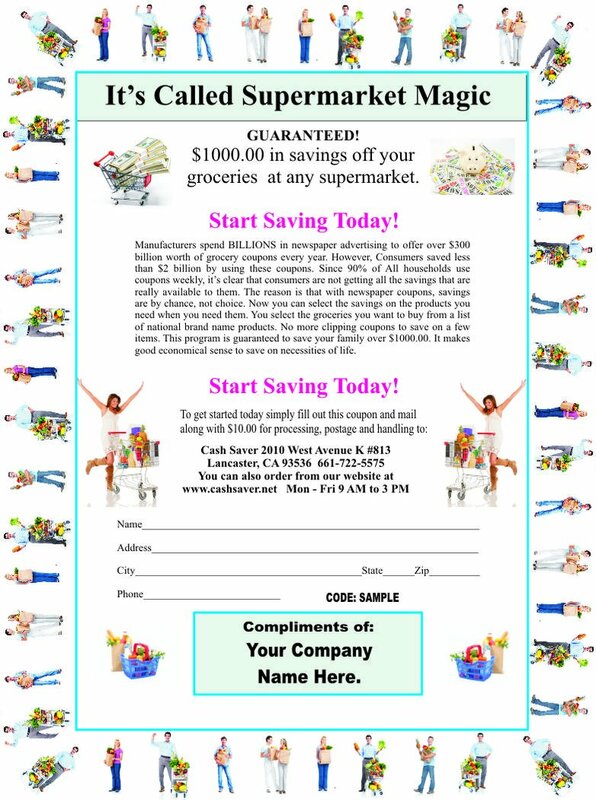 This program works if you purchase coupons every month. Have you ever been in line at your supermarket and a customer in front of you has a coupon for every item in their shopping cart? That customer was probably using this program. 90% of all households use grocery coupons? Everyone thinks that local newspapers are the only source of grocery coupons. The truth is, local papers contain less than 10% of the coupons available from the manufacturers on brand name grocery products. Are you easy to reach? Booking a room is easy and there is usually very little wait time. Besides the website, there is a pone number you can call with your booking questions. 661-722-5575. You can also call Anderson Marketing Concepts at 844-343-7802. If we are busy, please leave your name and phone number and best time to call you back. If you can’t wait, Text Carol at 503-801-0345. We have many busy times so you might have to leave your name and phone number and best time to call you back. All calls are returned promptly.